FOR ALL WHO KNOW THAT FREEDOM ISN'T FREE, WE OFFER THESE TAGS! You get two Service Dog ID cards with your order, one for your dog and one for you to carry in your wallet so you can easily show others what the law says. Choose from Service Dog, PTSD, Seizure Alert Dog, Service Dog In Training, Medical Alert, Search and Rescue Dog, Service Animal, Guide Dog, Hearing Assistance, Working Dog, Mobility Dog on your tags. These cards make it easy to educate the uninformed of your rights. 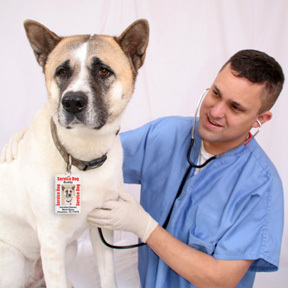 Your Service Dog ID Tags clearly identify your companion as a Service Dog with his or her picture on the tag. I frequently travel alone with my service dog and I don't like having her vest on her because it calls too much attention to her and, since I do travel alone, I try to minimize the fact that I might be a potentially "safer" target for someone looking to rob someone. With a tag, people will see it if they are close to us but won't even have a clue from across the lobby. Only dogs and small horses are now allowed by the New ADA Law to be service animals. We no longer sell these tags for any other animals. This as well as all your products are not only the best I've seen but very professional..and it helps those using them. Great Product, Great Customer Service thank you. This is my third order to update my info and I couldn't be happier with the quality and gray customer service. Thank You! This item was as good or better than expected. Very quality product. Have dealt with this company a few times now and certainly will again,and would recommend their products. Thanks for my second set of dog tags. Now that my puppy is all grown up in addition to being in a new state, we purchased a updated version as well as the new "Disabled Veteran" version that wasn't available 3 years ago. It's nice to have the I.D. tag for "Greeters" that automatically say "no dogs" allowed so I give them an education on their liability by not just asking if that's a service dog. Click the button below to add the Disabled Vet Service Dog Tag Set for Large Dogs (2 Lrg Tags) to your wish list.